English Plus is a small, friendly, fun, and also has a family atmosphere English school, which is the reason why we can listen to our students' comments directly and support them by providing necessary service in order to help them improve their English skills. 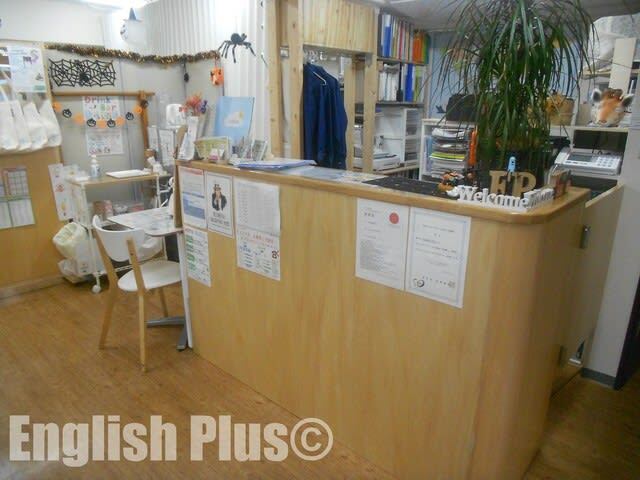 At English Plus, we mainly provide 90-min group lessons, which consist of maximum 4 students in a class. Actually, there are various features of our lessons and self-study support, and I'd like to write more about them. One of our features is "practical original lesson and curriculum." All of our group lessons are based on original curriculum, which means our students don't use specific textbooks or memorize dialogues in textbooks. The reason we are making our original curriculum is for our students to acquire basic English skills and communicate well. Basic English skills mean they can make sentences freely and accurately. Also, since we don't have any specific textbooks to read, our students have to communicate directly with other classmates and instructors in English. To master basic English skills and communication skills, our lessons are carried out on our practical original curriculum. Our original curriculum contains our instructors' teaching experience and some important points that we've learned through TESL curriculum. The curriculum is separated by each level, from beginner to high intermediate, and our students can effectively learn important tips for acquiring basic English and communication skills. In addition, this curriculum includes not only our instructors' teaching experience but also our students' and staff members' learning experience, so it is very practical. After every lesson is done, our teachers check the lesson to see if the lesson was easy for our students to understand or if there is something we should change about it. For better lessons, we update and improve our lessons every day. We are going to improve how to teach English from now on too.